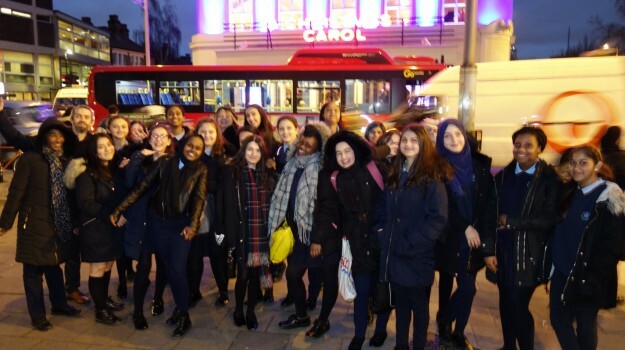 This year Year 9 are working alongside the Old Vic Theatre School club and and as part of this club in January, 30 Year 9 students visited the Old Vic to watch 'A Christmas Carol'. Zilan in Year 9 wrote "The play was incredible and very entertaining. It was very funny at times but then could turn serious instantly! It was interesting how the actors got the audience involved and made us feel like we were part of what was going on. The actors were focused to their characters and the whole play felt real, even the scary moments which added more excitement and fun. The songs they sang were really creative and the setting was great, even though the scenes changed a lot we could still understand what was going on and where the scenes were set. The actors costumes were fantastic and fitted the era the play was set in".